I am so excited to have a huge bunch of fresh basil, and I've never eaten roma beans, or cooked whatever that little disc shaped summer squash is called! Arugula/endive mix and red leaf lettuce: lots o' salads! Last week I ate the summer squash and the cucumber as they were, but this week I hope to incorporate them into a dish of some kind. Maybe squash muffins and a cucumber soup?? 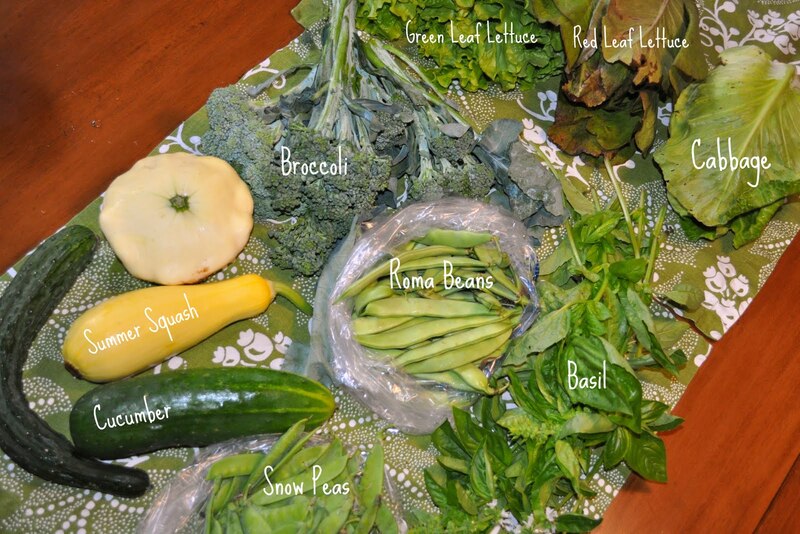 I'm loving your CSA posts & all the great recipes!! Love it! Looks like you're having a much better CSA experience than we had a couple years ago. I ran out of things to do with beets and radishes! Looks like a Patty Pan squash - yum! Yes! Patty Pan! Fun name--hope it tastes as good. So far, the CSA has offered a great variety. Of course there's some repetition, but I can't believe one farm produces such a wide range of produce. I'm loving it so far!